There’s no kicking Clark Gregg out of the MCU. He got killed by Loki in The Avengers but then got his own TV series. After five seasons, Agent Coulson finally did die on Marvel’s Agents of S.H.I.E.L.D., but the creators were kind enough to create a new character for him. They just won’t tell us who he’s playing. With Coulson gone, Mack is now taking over as director of S.H.I.E.L.D., which is difficult for both Mack and actor Henry Simmons. Gregg and Simmons spoke with us at WonderCon about each of their new roles in season six of Marvel’s Agents of S.H.I.E.L.D. premiering on May 10, 2019 on ABC. We saw you going off to Tahiti with Melinda May. Will we see what happened there at all? Were you surprised how quickly she confessed her love before going off to Tahiti? You’ve played Coulson for five years now. How did you start to build a completely new character? 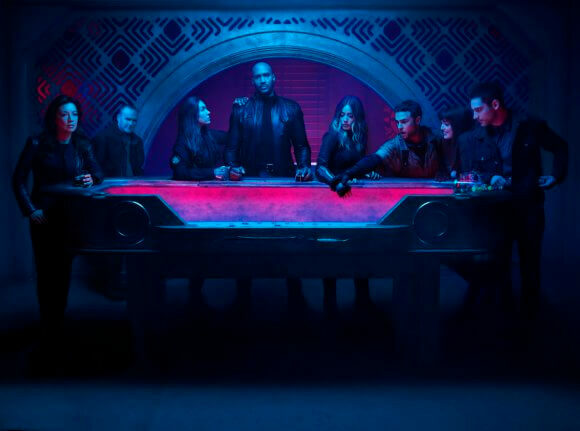 Henry Simmons: “I think Mack has changed in a way where because when he was out in the field with these people there was more of a camaraderie. But now as the director of S.H.I.E.L.D. there has been a distance between him and the others. As much as he would like to maintain that camaraderie, it’s not really acceptable in terms of trying to do what’s best. In the past Mack was typically the heart of the team but now that he’s the director who will he rely on as a sounding board?